The last few days have seen a mini-avalanche of commentary about Google Glass, a wearable ‘augmented reality heads-up display’, hotly anticipated for a late 2013 launch (at around $1500). As an early indicator of potential social impact, there are quite a few spoofs already out there. But what is it, and what are we to make of it? I will confess that I started out a skeptic (more on that later) but am now warming to the idea — but that it still has a ways to go. The simplest way to describe the benefit of Google Glass is that it’s a way to get the benefits of various functions of a smartphone, without the disruption of a smartphone — mainly the need to use hands and divert attention to look at a screen. This headset will allow user-perspective photos, videos, maps and short visual messages, all voice-controlled. An excellent short slideshow about Google Glass functionality can be found here. Google has released a video showing fabulous user experiences being recorded: hot-air balloon flight, trapeze, onstage at the ballet, stunt pilot, skydiving, roller coaster, etc. Exciting but a little breathless – – like the old joke about the little girl who wants feminine hygiene products for her birthday because they will let her ride horses and go to the beach like in the commercials – – most of the excitement is from the activities, not the device. Another more (literally) pedestrian video shows a guy walking around Manhattan, continuously taking care of business using Google Glass heads-up info, seemingly enjoying his surroundings (cue gratuitous dog interaction) while simultaneously (and impressively) managing to not fall into a manhole. This video was more interesting: it showed how it would feel to be continually engaged with the device – – but the texting-while-driving argument seems relevant here – – can we safely (and do we want to) ignore our surroundings as we focus on interacting with a device? Google Glass has some obvious disadvantages. It is still a little space-age nerdy (although talks are apparently in the works with RayBan, Warby Parker and others), and still likely subject to the frailties of technology (dropped signals, etc). It also seems to have the capacity to depersonalize interpersonal human interaction when one (or both) parties are assisted by (and perhaps secretly distracted by) the unseen notes popping up in their heads-up display. On the other hand, Google Glass embodies the remarkable promise of current hi-tech innovation. Rather than require humans to adapt to technology (think about having to learn DOS commands), it strives to adapt technology to natural human behavior to make life more functional and interesting. By this measure, Google Glass, by removing the need to constantly manipulate a phone, succeeds in creating a big vision – – but the big question still remains – – who is going to want to wear this thing? Posted in Marketing Strategy, Technology and tagged Google, Google Glass, RayBans, Star Trek, technology, Warby Parker. Bookmark the permalink. These days it’s simply not good enough to have a token effort at social media – if you’re in, you need to be all-in. A recent column by Kate McMahon on MorningNewsBeat (below) summarizes it nicely, using the recent case of Marco Rubio and comparing Poland Spring’s inaction to Kraft’s opportunistic action for Oreos during the Super Bowl (instantly creating and Tweeting a catchy message during the blackout). The new imperative is not just to manage your followers in real time, but to take advantage of the ability to jump on opportunities real-time, as they present themselves. So there’s a defensive reason (manage potential crises proactively) and an offensive reason (take quick advantage of spontaneous good luck by leveraging through social media). The full text and link to Kate’s commentary is below. By they way, MNB is a great quick digest of a variety of consumer and retail issues, every day. We are referring, of course, to Florida Sen. Marco Rubio’s awkward lurch for a bottle of Poland Spring water and subsequent slurp during his Republican rebuttal to the president’s State of the Union address last week. Within minutes the Twitter universe lit up with #watergate tweets, and social media watchers anxiously waited for Poland Spring to capitalize on its prime-time product placement moment. Even Rubio himself good-naturedly tweeted a photo of an empty Poland Spring bottle right after the speech and has since parlayed his guzzle into a $125,000 boost to his campaign PAC coffers through the sale of Rubio water bottles (certainly abetted by a “Saturday Night Live” spoof). But as the hours ticked by, and the gulp was replayed on newscasts, parodied on YouTube and the talk of Twitter, Poland Spring remained radio silent. Not an acceptable response, particularly for the top-selling spring water brand in America, owned by the multi-billion dollar international conglomerate Nestle. Turns out Poland Spring stopped posting on its two Twitter accounts as of July 2010 and January 2011, respectively. Really? In fact, the Oreo tweet was retweeted 10,000 times in one hour and lauded as the advertising winner of the night. And it illustrates the phenomenon that major nationally televised events are essentially “two screen experiences” – what people are watching and what they are tweeting simultaneously. Since Oreo had a commercial airing during the Super Bowl, cookie execs and its ad agency team had gathered in a “mission control center” to watch the game and monitor social media channels. With all the key players on hand, they were able to design – and get approval for – a witty graphic within minutes. Granted, Oreo had a multi-million dollar investment in the Super Bowl telecast and Poland Spring had no way of knowing its product would capture the nation’s attention, thanks to a parched freshman Republican from Florida. But the two cases illustrate that real-time interaction with consumers on social media is dictating the discussion. If you aren’t prepared to join in, you will find yourself left high and dry. Posted in Marketing Strategy, Social Media and tagged kate mcmahon, Marco Rubio, morningnewsbeat, Oreos, Poland Spring, Social Media, Super Bowl, Watergate. Bookmark the permalink. BULLETIN: Management listened! (and acted) Good for them! Very recently Maker’s Mark made the news by announcing a reduction in alcoholic volume from 45% to 42% (otherwise known as diluting). This commentator (and more importantly, consumers) questioned the wisdom of the move, which Maker’s Mark explained as necessary to meet demand. Today (Sunday) Maker’s Mark announced via Facebook and Twitter that they have reversed their earlier decision and are keeping the product as is. We applaud management for acting quickly and decisively based on consumer input. The response has been immediate and positive – – already there are 24,000 positive comments on Maker’s Mark FB page. They have turned a negative into a positive and reclaimed the loyalty of their customers. You can go to their site for the full announcement. Below is an excerpt. Posted in Branding, Marketing Strategy. Bookmark the permalink. I know absolutely nothing about bourbon, but even I have to comment on what appears to be a classic case of unintended mixed messaging (and perhaps short-sighted judgment), that may likely have a huge negative impact on a classic brand. Maker’s Mark is a venerable premium bourbon whisky, taking 6-8 years to make. It even has an Ambassador’s program of people who enthusiastically and voluntarily evangelize the brand. It is a unit of Beam. Recently Maker’s Mark, in dealing with a ‘bourbon shortage’, announced that it would permanently reduce from 45% ABV (alcohol by volume) to 42% ABV, in order to be able to fulfill growing demand. There is no change in price. USA Today has a good commentary – you can find it here. Maker’s Mark management explains this formulation change in the language of alcohol reduction, in order to ‘extend supplies’. But it didn’t take long for the public (and press) to explain the change as dilution, and the motivation reinterpreted as being profit-driven (as opposed to consumer-driven). Additionally, MM management stated that the new formulation was tested with MM users who ‘couldn’t tell the difference’. (apparently this taste panel was MM employees). We live in an increasingly transparent world – why would this explanation create issues? Well, several reasons, dealing with both the communication as well as the decision itself. 1) Don’t mess with my product. Consumers are extremely sensitive to, and skeptical of, any sort of formulation change. Loyal users, remember, are loyal because they’re happy with the product as is. Any stated change, even a purported ‘improvement’, is almost by definition a change for the worse. New Coke was over 25 years ago but the lesson holds now more than ever. In addition, by clearly stating there will be a reduction in alcohol content, MM is in effect saying we’re compromising one of the core elements of the product. In this case, not only different, but clearly worse. This fundamentally hurts this premium brand’s value. 2) Perception is reality – – even if there is no noticeable change (and that’s a little doubtful), the fact that consumers know they’re drinking a diluted product will give them the perception that it’s not the same. 3) Don’t violate my trust. This is even more pronounced in a luxury category like whisky, which is extremely personal, one’s choice is both a badge and source of pride, and where there is a greater than average emotional connection between user and brand. Any attempts to disguise or cleverly position product changes will be seen as a betrayal and will undermine loyalty in a hurry. Again, the brand will suffer. 4) Beware ‘small unnoticeable changes’. I once heard incremental product changes explained this way: You can start with a Snickers bar and remove a peanut every year; not noticeable but one day you’ll wake up with a Three Musketeers. The fact that Maker’s Mark used an internal panel fails in two ways: a) this is no substitute for actual quantitative testing with consumers and b) it smacks of breathing one’s own exhaust — I can just imagine the action standards that were set. 5) Don’t ignore the power of social media. Reaction, judged by comments on Maker’s Mark FB page, is decidedly negative, most in the ‘betrayed’ or ‘I’ll never use this brand again’ category. The Chairman’s response/comment, which was tweeted recently, can be found here. But to the extent that this defends their position rather than acknowledging negative consumer responses, sounds a bit like the Applebee’s fiasco. In the end, the market will be the ultimate judge. But in a) diluting a premium product in the first place and b) being aggressively transparent with a negative message, Maker’s Mark may have unwittingly lost in the long run. Faced with a shortage (of bourbon or profits), Maker’s Mark may have been better off with a modest price increase (not optimal but would reinforce the premium image), and then taking the opportunity to promote its shorter-lead-time new products (Maker’s 46 and Maker’s Mark White) while core MM capacity is built. In any case, perhaps in this case it would have been better to soft-pedal a quality change in the core product. Posted in Branding, Marketing Strategy and tagged Maker's Mark Marketing. Bookmark the permalink. Where is the Olympic brand going? Wrestling was just eliminated from the 2020 Olympics by the International Olympic Committee. What? And golf and tennis are included? Apparently wrestling was odd man out – 26 ‘core’ sports vying for 25 spots, and the criteria included things like television ratings, ticket sales, anti-doping policy and global participation and popularity. —> Why should we care? Why should the Olympics care? The Olympic credo is ‘Citius, Altius, Fortius‘ – Higher, Faster, Stronger – – and the Olympic brand had come to mean a way to settle the ancient traditional arguments about who’s the fastest man, who’s the strongest man, etc. Over the years, the Games tried to hew closely to this idea, but inevitably had to adapt to survive, most importantly becoming gender-equal, but also bowing to media-driven economics by adding sports that would be unrecognizable to Baron de Coubertin (e.g. beach volleyball, BMX cycling) but that appeal to a target demo. One of my earlier posts lamented the reinstatement of golf to the 2016 Games (it was an Olympic sport in 1904), because along with tennis, there are already ample opportunities annually to decide the top athletes in these sports, and that they would necessarily crowd out something else more worthy of the Olympic spotlight. —> Wrestling is now just one of an at-large list of candidates including roller sports, sport climbing, wakeboarding and wushu that will apply for participation in 2020. —> Perhaps we’ve reached a tipping point. With this move, the meaning of the Olympic brand becomes less clear. While it originated as the indisputable contest to crown the world’s best in the basic athletic skills for the following 4 years, as it gradually sheds its legacy and chases ratings, it now seems on its way to becoming another (albeit very large) global media/entertainment extravaganza. Posted in Branding and tagged Olympic wrestling, Olympics. Bookmark the permalink. Readers of this blog know that I am a strong believer in the power of brands. How else, in one or two words, can a rich set of expectations, promises, emotions and attributes be powerfully and instantly telegraphed? Think of what immediately comes to mind, for better or worse, when you hear brands like REI, Whole Foods, Apple, JC Penney, Disney, The Republican Party, or Trabant. Brands are living representations of the customer experience, at all touch points, and need to be carefully watched and managed. Ok, we knew this already, right? Of course. Well, this morning I ran across 2 things that seemed to contradict each other. But the takeaway point is, there is another powerful influencer that can undermine or overwhelm the power of a brand – – VALUE. Thing 1) A soon-to-be-released study from the Grocery Manufacturer’s Association reveals that only 41.7% of consumers claim that price is ‘very important’ in food shopping. Also, for the first time in recent memory, less than half of consumers (49.1%) say items on sale/money-saving specials are “very important.” What does have influence? Service, expertise, guidance. You can read a preview here). 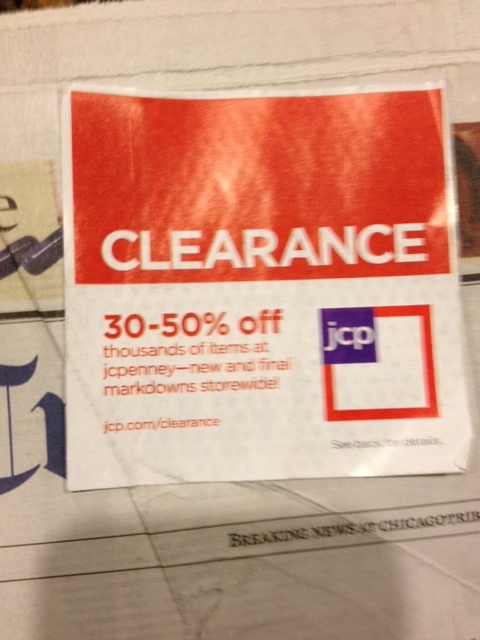 Thing 2) My morning paper had a blow-on sticker advertising a clearance event at JCP. If you’ve been following, the brilliant merchandiser behind Apple Stores’ success, Ron Johnson, has taken over at JCP with a philosophy of weaning deal-crazed consumers, through elimination of promotions and investment in store upgrades. The reaction from the Street and the media tells us that his job is not quite done yet. (and the sticker is Exhibit A.) A good NYTimes overview here. So what is the point? These 2 observations would seem to be contradictory. In one, consumers are telling us they don’t focus on just price; in another, evidence that consumers are stubbornly insisting that price matters. The point is that brand strength is absolutely important, but is in the end one of several interconnected purchase influences, all of which direct the final decision. An exceptionally strong brand like Apple, representing a unique product/service that is not available elsewhere, can drive purchases among consumers even if it’s not the most economical. Apple has earned this strength through its excellent offerings (including the retail stores), although the Samsung brand now seems to be on the ascendance through its own innovation. JC Penney, on the other hand, is a brand that claims strong awareness, a seemingly consistent image (retailer of good value, good quality products), but is not unique in the market. There are substitutes everywhere and the JCP brand is not enough to compel purchases. Thus, when faced with elimination of expected discounts, consumers are happy to vote their dollars elsewhere. I admire Johnson’s goal with JCP; perhaps rather than rallying disproportionately around the ‘no discounts’ flag, more of the investment (and messaging) could be directed toward what grocery shoppers look for: Service, expertise, guidance, and maybe things like selection. (although I’m no retailer). The clear lesson – all brands need to be carefully assessed and business strategies molded around the strengths and weaknesses revealed. No brand is so strong that it is a replacement for delivering clear value. Posted in Branding and tagged JC Penney. Bookmark the permalink.